How terrifying can this get? Passengers composed themselves and narrated their almost nasty experience when and fly jamaica plane crash landed at the Guyana Airport. The pilots explained that the plane had to turn back after developing a “technical problem” en route to Toronto, a move leaving at least six passengers injured. The Boeing 757 was carrying 118 people including two infants and was forced to turn round minutes into the flight due to a “hydraulics problem”. “We can confirm that flight OJ256 bound for Toronto has returned to Georgetown with a technical problem and has suffered an accident on landing,” read a statement from the company. In the emergency landing the aircraft overran the airstrip, crashed through a perimeter fence and came to a rest a few feet in front of a steep ditch. Passengers exited the craft on escape slides. In 2011 a Caribbean Airlines plane landing at Cheddi Jagan International Airport overran the airstrip, resulting in seven injuries after the plane broke through a fence and crashed across a road. The runway has since been extended, something which may have prevented a worse crash occurring in this instance. 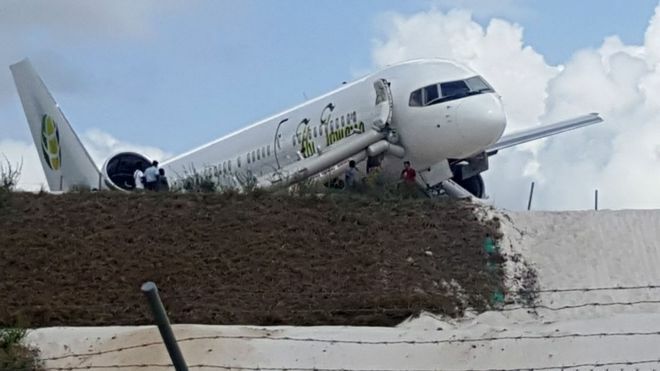 “Where the aircraft veered off is about the exact same place the Caribbean Airlines (plane did)… so fortunately for us on this occasion, the extension was there so they were able to utilise the extension,” Mr Patterson said, adding that investigations into the matter had already started. Fly Jamaica Airways was formed by the Chief Executive Officer (CEO), Guyana-born Paul Ronald Reece, Mrs. Roxanne Reece and three Jamaican shareholders including Captain Lloyd Tai and Mrs. Christine Steele and Mrs. Shaun Lawson-Laing. Captain Reece is also the owner of Wings Aviation Ltd, based in Guyana, which owns and operates Cessna aircraft in the interior of Guyana. End of road for rogue miraa’s transporters!